Today I got around to uploading my presentation from Information Online to SlideShare. I had to remove the “Benny Hill” theme from it, as I only had permission to use it for the conference, not for publishing online. If you only want to watch the video (again, without a soundtrack), I’ve put it on YouTube. Because it’s such a major spoiler for geocachers looking for the cache, it’s only available through the link, it’s not publicly visible. I might change this in the future, though. For the last twelve months I’ve been lucky enough to take two days a week off as parental leave to look after our two sons. 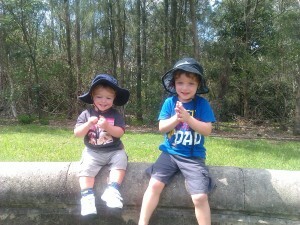 Today was the last day that both of the boys were with me – our eldest will be at pre-school tomorrow. 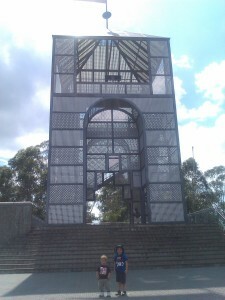 We had a fun day out at Bicentennial Park at Homebush Bay. 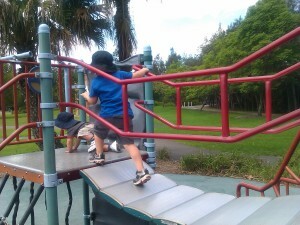 The boys enjoyed playing in the two playgrounds, and we climbed the Treillage Tower for a view of the park. I was very impressed that our two year old climbed up all the steps himself (the tower is three storeys tall). Fun at one of the playgrounds in Bicentennial Park. After our morning at the park, the boys wanted fried rice for lunch, so we headed to a shopping centre food court for that. There’s a play area at the shopping centre, so they had another play there. It was a busy day, but a nice way to end what has been a great year. I feel very lucky to have been able to spend this time with the boys, and I think they’ve enjoyed it too. I’ve decided to make a change to the blog. I’ve moved to WordPress as my platform, and I’ve also now got my own domain (http://www.geocachinglibrarian.com). I’ll leave the old blog up, but all new posts will be coming from here.I’ve also got a new Twitter account (@GeocachingLibn) which will have all the posts fed to it. It took a while to get it all set up, but I’m happy wiht it now. My next step is to come up with a look and feel for the blog, including a logo of some sort. The catalyst for all this change is my upcoming presentation at Information Online. I’d like it to be the launch of my new online identity, as well as a great presentation, so I thought I’d jump in and give this web site thing a go. There will still be posts on a range of topics, but I feel like it’s a bit more united or professional to have my own website. And it’s fun to have a play with, too!